Syndicate Lofts – Stef Bals ~ A Real Young Dutch Talent…. Home › News › Stef Bals ~ A Real Young Dutch Talent…. Stef Bals ~ A Real Young Dutch Talent…. 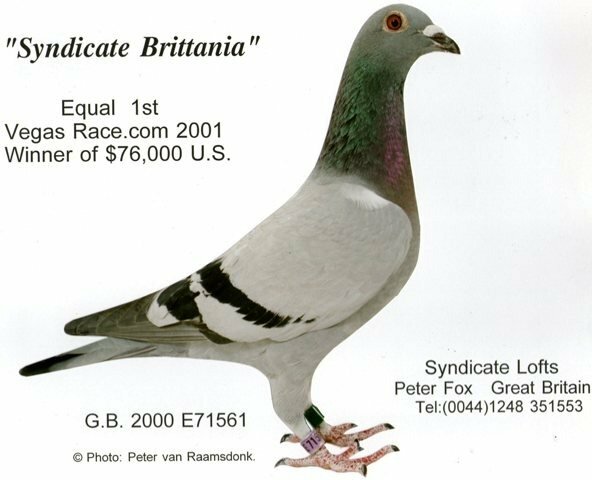 *This is ‘Syndicate Britannia’ a big winning hen of looks, bloodline and style. Her bloodline is still as vital for our own loft today. She is the grandmother of the ‘Inbred Topo’ hen. I read with great interest and pride the rise of a generation of great young talent in the Dutch pigeon sport. Stef Bals and his young mentor Maarten Huijsman being two who have a golden future in the sport. I read with interest because its always great to read anything positive about the future of the sport and pride because we had a hand in their current successes. In 2004 the NPO (Dutch organising union) introduced a scheme for established fanciers to gift birds and help to young starters. We was asked to donate a gift to a young fancier Maarten Huijsman from Hoogerheide . One of the youngsters we gifted was NL08-1679240 a young hen that would be known in the future as Inbred Topo and become a top breeding hen for Maarten. Among others she bred his basic breeder ‘NPO Man’ that would become a sensational breeder. Yesterday I noticed an auction on PIPA for Maartens close friend Stef Bals and the first lot is ‘Golden Yearling’ another top son of ‘NPO Man’ and winner of a Sens Provincial race against almost 5000 birds. 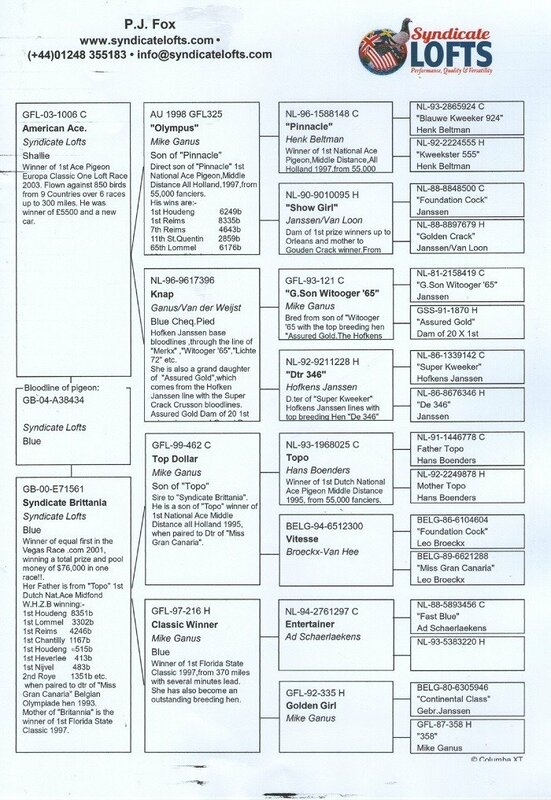 A look at the pedigree indeed shows that he was again a grandson of the gift ‘Inbred Topo’ hen that came from our loft. 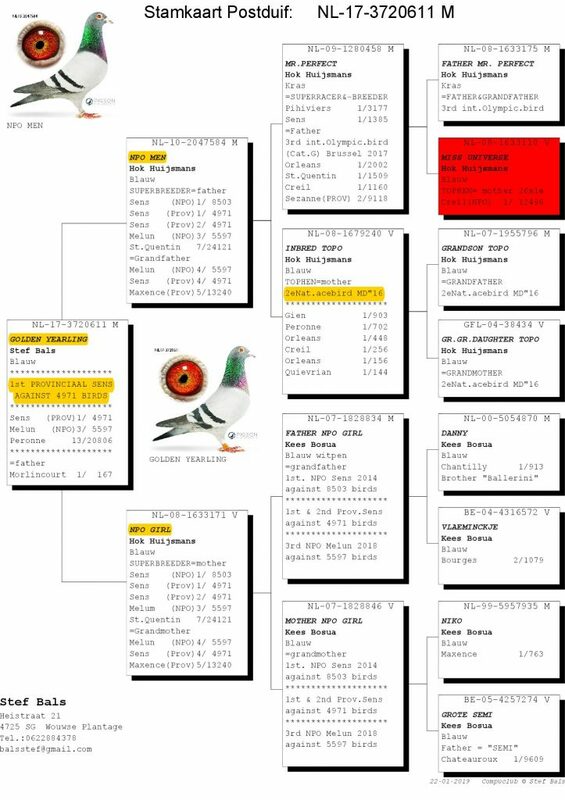 I noticed a few errors in the ring numbers on the pedigree however it still doesn’t leave any doubt about the actual breeding of the bird…like for example the mother of ‘Inbred Topo’ is detailed as GFL-04-38434 when it is actually GB04A38434 and we attach a copy of the original pedigree with this post. The only thing that we find very disappointing though is that we the breeders have been omitted from the history of the pedigree. 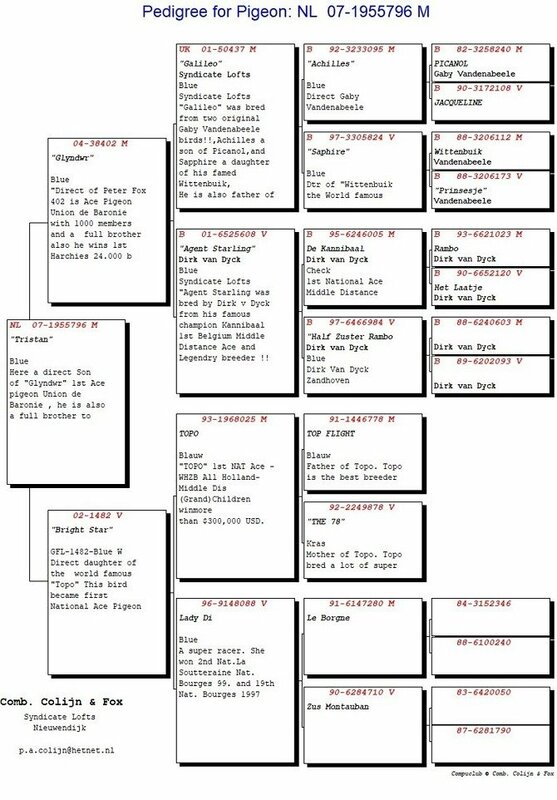 The breeder of ‘Inbred Topo’ is Colijn Ganus Fox or Syndicate Lofts whichever and not Hok Huijsmans. Same goes for her father NL97-1955796 and her mother GB04A38434. I am not saying even our pedigrees are perfect but we try our best to include credit to the original breeders where it is possible. Sometimes it is not possible because the original pedigrees that we received for the ancestors did not include the origins and it is way too far back to verify anything. But we do our best. But a gift pigeon to a new starter that became a principle pigeon that we have become suddenly marginalized from in not very sporting to say the least. Its not difficult especially as the same pedigree gives the origin of the mother of ‘Golden Yearling’. I am sure the future is very bright for the new crop of young fanciers however old fashioned sportsmanship would be a useful basis to start. 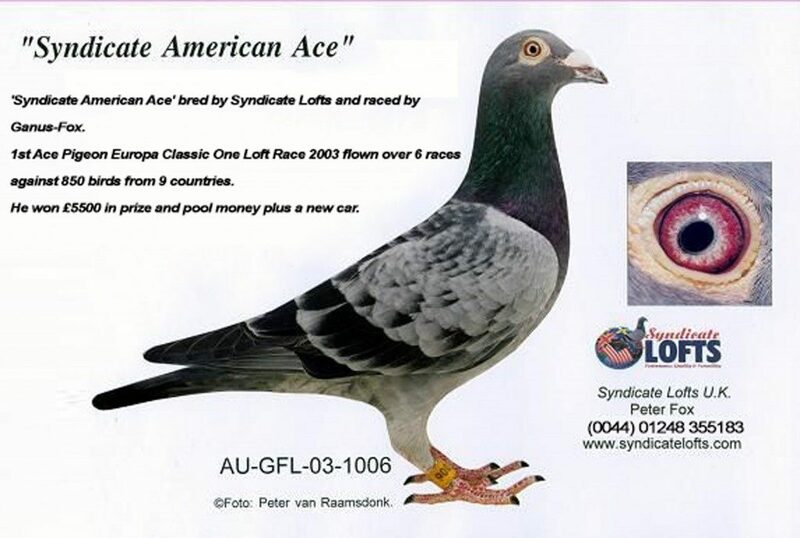 Syndicate American Ace was paired to Syndicate Britannia to breed the ‘Inbred Topo Hen’ of Maarten Huijsman.